For Type, click Run Now. 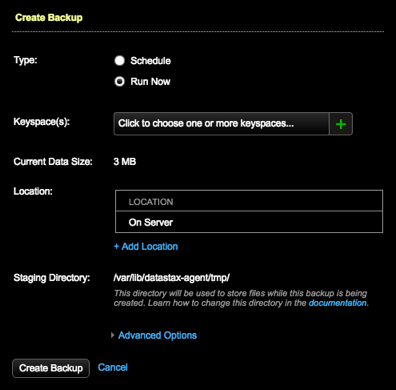 Keyspaces: Click the plus (+) icon to select one or more keyspaces to back up. To keep the list open when making multiple selections, press and hold the Cmd key (Mac) or Ctrl key (Windows/Linux). Select All Keyspaces to back up all keyspaces.